Make sure that you follow the guidelines. Click on the headlines below. Characters must have an eggshell, matte or non-glare finish. For easier readability, avoid signs with a shiny or gloss finish including some metal, glass and stone finishes. Characters must contrast with the background by 70%. Room signs must have raised characters and use Grade 2 Braille. Tactile characters and Braille must be raised 1/32". Unlike Grade 1 Braille, Grade 2 Braille uses a series of contractions which forms a shorthand version of the text. Characters must be in upper case and use a sans serif or a simple serif font. For room signs, the font can be no less than 5/8" high and no more than 2" high. Overhead signs require fonts that are at least 3" high. A Pictogram is optional -but, if used, the Pictogram must be at least 6" high. The equivalent verbal description must be placed directly below it, along with the accompanying Grade 2 Braille. 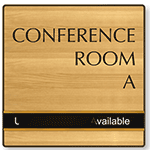 Room signs should be mounted on the wall adjacent to the latch side of the door. When mounted, the centerline of a room sign should be 60" from the floor. They do not have to use raised characters and Braille. Information such as employee names, dates, policies, directional information and schedules can be hand written or typed by the user. This part of the sign does not need to comply with ADA. Learn about the law from the U.S. Department of Justice ADA home page.